Jolene Navarro here. Checking in from the Texas Hill Country and a season of weddings. As a romance writer, I LOVE weddings. From the big to the small, from the simple to the lavish and everything in between. I look to see how the details (wedding to grooms cake) speaks to the personalities of the bride and groom. The first of my sister’s children was married this fall. 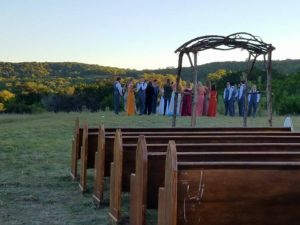 My nephew and his beautiful bride spoke their vows surround by the beautiful hill country on a ranch outside of Bandera Texas. 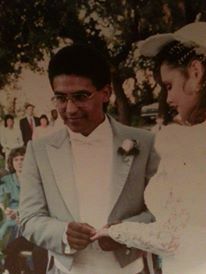 The bride had lost her mother so bits and pieces from her mother’s wedding dress were incorporated into the wedding dress my aunt made for her. It was a beautiful way to honor her mother’s memory as she starts out on her new journey. The buttons of a mother’s dress. Then at the end of the year (literally) we headed indoors to witness my husband’s niece marry her Airforce man. Something about the sword ceremony is just so moving. The touch of her winter wrap was so glamorous. I don’t think I have seen so many flags at a reception. 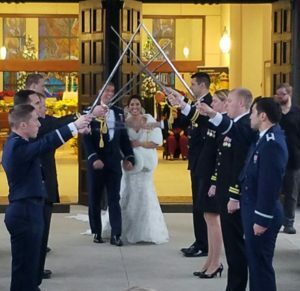 Winter Wedding with a Military Tradition. 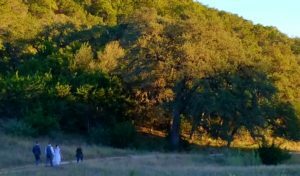 Then in March it was back to the Hill Country for a cousin of mine. Another ranch, the Y.O. Ranch outside of Kerrville Texas. 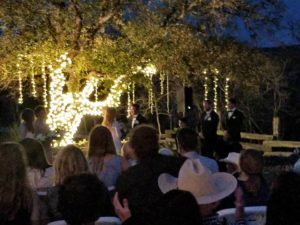 They timed it so the sun would be setting and darkness would cover us by the time the vows were said under a giant oak tree draped in lights. 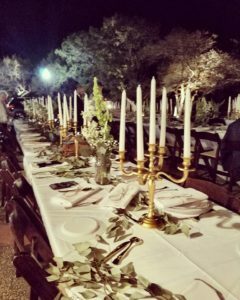 Texas Hill Country Wedding under the Lights. 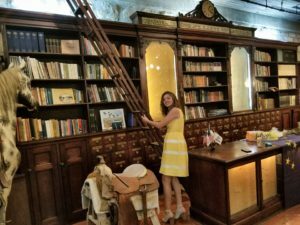 It was like stepping into a Texas fairy tale – where Beauty and the Beast meet the Wild Wild West. Table setting and library included. Outdoor weddings seem to be the thing. From the time I started thinking of my own wedding, the only thing I knew for sure is that I wanted it outdoors. Twenty-nine years ago I got my wish. We stood next to the gorgeous Frio River in Leakey Texas under the tall cypress trees in an area called Cathedral park. It was a lovely June day that will always be dear to me. 1989. My Wedding on the Frio River. But I think one of the most romantic settings took place a few years back (they now are the parents of two of the cutest boys). 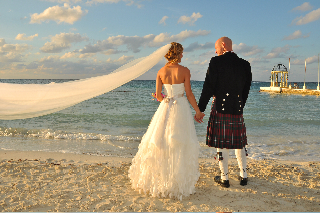 Beach weddings are things of pure romance, but add a kilt? Be still my romance writing heart. I have a cousin that was married on the beach in a kilt. It was his idea and his lovely bride went along with it of course. Beaches and kilts, what else do you need? What is more romantic than being married in a Kilt on the beach. Logan and Liege Kensing. They just needed a horse. So am I alone in the kilt obsession? I really hope one of my kids want a kilt in their wedding…and horses…and a great location by a river or on a beach. So you know I must have a couple of weddings in my stories. I think one of my all-time favorite scenes I have written was in Lone Star Bride. The wedding happens in the middle of the book. The bride’s mother is dead, so a group of women from the community surrounds her and bring in the beautiful traditions of the Spanish. The older woman wrap her in love to send her on her new journey. Sometimes I end my book with the words of love being spoken and confirmed. I have written several proposal scenes, but I went all out with the wedding in my latest release, The Texan’s Twins. The hero and heroine were secretly married in college. Now after a long road back to each other and finding their faith, I had to end it with them sharing their vows in front of her family and the whole community. Reid stood on the top step of the restored ranch house. It was finally happening. The old pecan tree shades the guest sitting in the front yard. The sun was shining, and the air was crisp. A perfect February day in Texas. Hanging from the tree, long yellow-and-white ribbons danced in the wind with tiny paper hearts tied to the ends. Large white spheres that radiated with light were scattered among the hearts and lines the porch. They were all waiting. Over three hundred people stared at him, but he didn’t notice. On the lower step, Bobby and Philip chuckled. Reid pulled at his coal. He had never worn a tie in his life. Derrick, one of the teens from the church, sat on the far end of the porch and strummed on a guitar. Then the music changed. Lifting his head, Reid stopped breathing. What’s your favorite wedding memory? 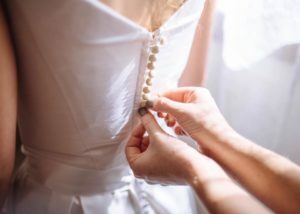 Is it yours or someone else wedding? Do you look for more than just I love you at the end of a story? Is popping the question a good place to end, or the wedding. Maybe forward to the birth of a child? What makes the best happy ending for you? hmm, it depends on the couple and the story as to if it would be nice to have it end at the proposal or the wedding or beyond. When our son got engaged, there was no doubt in his mind that the two of them would have a civil war themed wedding. Richard is a history major, ( he has lived history since he was a toddler) and so is his fiance. Richard introduced Kristen to Civil War reenacting (which he had been doing since he was 13) and she fell in love. They both sewed there own clothes. For the wedding Richard made all of the men’s pants, jackets, vests and shirts. With the exception of my dress ( I made that, she had plenty on her plate ) Kristen made all of the dresses, corsets and hoop skirts. Her dress was fabulous. A lot of the people who where re-enactors came dressed up. Some who were not rented outfits. They had friends who were in a reenacting civil war band at the reception. And then when my sister got married (both her and her fiance reenacted the fur trading era ) and they both ride Harley’s and have a number of friends that do also. So their wedding was out of doors. April and Eric were dressed in their American Indian leathers, she rode on Eric’s bike behind him. And a number of their friends on bikes where behind. Everything outside was American Indian. So cool. Even the cake looked like wood with flowers. And the best part I was able to be of help getting both weddings going from the begging of planning. Wow. I would love to see pictures!! That sounds fabulous! Thank you so much for sharing. Hi Lori! Wow – the civil war themed wedding sounds delightful. The civil war is one of my favorite American history time periods. We have a friend, who does Civil War reenactments. We went to one he was participating in. Such a learning experience. Best wishes and happy reading. Beautiful pictures of dream weddings. I love the book cover. Thank you, Reader I don’t have control of what is posted. So yes this is posted. Some beautiful weddings! I would love to have seen the Beauty in the Beast one with the library! I agree that Happily Ever After doesn’t end with the vows spoken, and they ride off into the sunset and never have any problems ever again. That’s why I chose to write a Christian Romance series (the “Love is…”) that continues after the wedding. Marriage is hard work, and love takes compromise. The wedding is beautiful, but it’s just a one-day ceremony. Marriage takes the rest of your life. What great pictures! The happiest wedding memories for me are from my own wedding, but one of the most memorable is attending my mom’s friend’s wedding when I was a child. It took place on the train as it went to the Grand Canyon! As far as happy endings go, I like any that you mentioned. I don’t know that I prefer one over the other as long as the basic story is closed out with a HEA. A train and the Grand Canyon! Wow. That sounds like it belongs in a story. Hi Jolene! Thanks for sharing these unique inspiring weddings. Still a little cold for an outdoor wedding in the the north country – Michigan. June is the wedding month in the Midwest. Our middle son was married my the bride’s uncle on the shores of Lake Michigan at sunset. 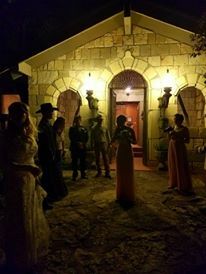 Last September my husband officiated a wedding overlooking a vineyard at sunset and the reception was in a converted barn. In May he is officiating a wedding in small country church located in historic Michigan park. He remembers attending the church with his maternal grandmother, who played the organ. Best wishes and happy writing. The answer to the question The Best Happy Ending depends on the main theme of the story – is it the romance, the wedding, or having children. I have read them all and most of the time the author gives the readers a satisfying believable ending. Appreciate having more than a Hallmark romance ending, which is a kiss. I do like a little more of their lives too. Thank you. Those all sound like lovely weddings. There is nothing wrong with wanting it all. LOL Yes #Kilts4Ever. I love a good wedding story. I love when the stories end in a proposal but I find my self wanting to know more of what happened after the proposal. Thanks for sharing all those weddings. Each one is unique. My two daughters both got married on the beach near where we lived at the time, but no kilts were involved. When I write a series, I often put the wedding of the couple from the previous book in the next one. That way the reader gets to revisit that couple. Oh, two beach weddings! I think it’s nice to have a wedding in the background. thanks for sharing the weddings with us. I loved the pictures. Memories from weddings are neat, I watch a show once in awhile called Four weddings and I think that one memory would stand out is having kids in the wedding. There was one picture I thought about adding – my cousin’s little girl was in my nephew’s wedding. She was very enthusiastic about through the flower petals up high and making it a grand gesture. It was so cute and she was just filled with joy. I like hearing what happens after proposal. I always want to keep reading. I guess that is why I like series. As long as it is HEA I’m fine with different endings though. Before I had an e reader I would read the end of print books to make sure the end was happy, then I would read the rest of the book from the beginning ! I’m right there with you. I will read the end if it is not a romance – romance authors know to provide a happy ending or they will not make it. Every other genre I have to read the ending.